Returning the Favor: Who’s Really Saving Who? When Barbara Bowman went to the Best Friends Pet Adoption and Spay/Neuter Center in Los Angeles last year, she thought she knew what she was going to leave with. ‘I was looking for a black cat, and I already had a name picked out: Jack;’ she says. Who she found, however, was Leo. And, looking back a little over a year after she first met Leo, she couldn’t be happier that Jack the black cat ultimately didn’t materialize on that fateful day. “ After all, Leo saved her life. ^ Cancer survivor Barbara Bowman with Leo, the cat she credits with saving her life. 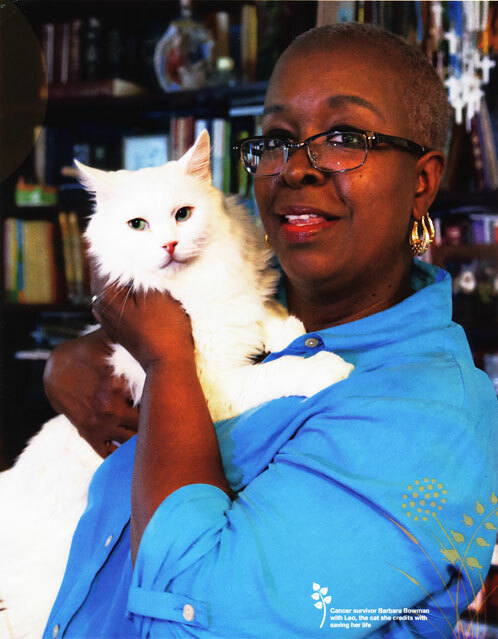 “ While Barbara and her daughter, Chakiyah, initially set out to locate and adopt a black cat who would be named Jack, Chakiyah was drawn to a large, long-haired white cat instead. “ ‘I was walking by his cage and felt him grab at my sweater,’ she recalls. She liked his playfulness and his aquamarine eyes, and knew right away that this was to be their cat. Barbara says, ‘I have a soft heart. I couldn’t say no.’ When she held the white cat, Barbara fell for him, too. They decided to take him home, naming him Leo for his lion-like hair. “ Barbara, who lives with her husband, children, two other cats and two dogs, admits it’s a busy household. ‘Leo didn’t know what to do in the beginning,’ she says. ‘But by the second week, he started to come around.’ It turns out he’s a lap cat, and Barbara’s was his favorite lap. As he began to sit with her more often, Barbara noticed that Leo would start kneading her lap and then moved up toward her chest. She says, ‘At first, I felt special because I was the only one he was doing this with. He did this every day for a week.’ But then he started doing it with greater frequency. He continued to gravitate to the same area of one of her breasts — so much so that his strange behavior prompted her to do a self-exam. She felt a lump. She called her doctor and, after a mammogram, ultrasound and biopsy, it was confirmed: She had an aggressive form of stage-three breast cancer. 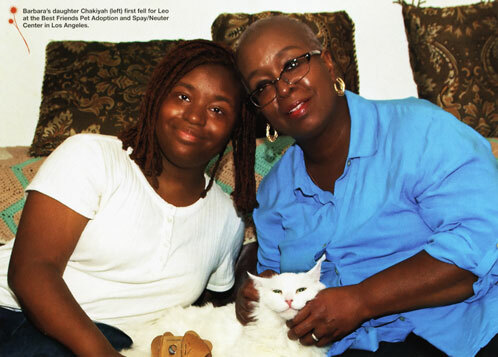 ^ Barbara's daughter Chakiyah (left) first fell for Leo at the Best Friends Pet Adoption and Spay/Neuter Center in Los Angeles. “ At first blush, it could seem that Leo finding Barbara’s cancer was a fluke, a once-in-a-lifetime occurrence. Even a coincidence. But as it turns out, there are numerous stories similar to theirs. Many people have reported anecdotally that their pets alerted them to the fact that something was not quite right. Like Ricky Hatfield of Williamson County, Illinois, whose normally well-behaved retriever head-butted his groin. Or the U.K.’s Sharon Rawlinson, who is grateful to her Cavalier King Charles spaniel for pawing at and standing on her chest. In both cases, tests confirmed what the pets already knew: cancer. “ In 1989, the possibility that an animal’s nose knows gained global attention when a letter to the editor from two dermatologists was published in the medical journal The Lancet. The letter stated that their patient’s dog wouldn’t leave alone a small mole on the patient’s leg. The dog continued to fuss at the mole until, one day, she pounced and bit at it. The dog ignored other moles on the patient’s arms and legs and had never bitten her before, so the behavior was strange enough that the woman insisted on having the mole biopsied. It turned out to be malignant melanoma. The untrained, mixed-breed dog sensed something. In the years since, the media has been peppered with stories just like this one. “ And all the stories have certain similarities; the pets are acutely interested in a small, targeted area of their human’s body. They tend to sniff and paw or dig at an area, sometimes relentlessly, returning to the same place again and again over time. Dina Zaphiris, a dog trainer and medical scent detection expert based in Los Angeles, has seen this behavior thousands of times in the 20-plus years of her professional life, which includes training search and rescue dogs. This phenomenon is not surprising to her at all. She knows that dogs can smell cancer. In fact, she has trained them to do it. “ Enthusiastic about her work, Dina can talk at length about dogs’ abilities, especially their unique connection to helping people. ‘Dogs and humans co-evolved, and very few other species have done that,’ she says. ‘Our survival depended on each other.’ For centuries, humans have relied on dogs’ extraordinary scenting capabilities to do things we can’t. Dina says, ‘Dogs can smell things in parts per trillion. An example of that would be (smelling) one drop of blood diluted into 20 Olympic-size swimming pools.’ It’s the equivalent of finding the proverbial needle in a haystack. “ In 2003, Dina participated in her first study with the Pine Street Foundation, a California nonprofit dedicated to cancer research and education. The purpose of the study was to determine how accurately dogs could detect lung and breast cancer in human breath samples. Evidence already existed that there were biochemical markers in exhaled breath from lung and breast cancer patients, but no technology was able to analyze chemicals in the breath to accurately detect cancer’s presence. “ Dogs who do make the cut, Dina says, ‘have tremendous drive for their work and for their reward.’ A dog’s reward is based on what he or she likes best — a ball for a ball­crazy dog or a treat for a food-driven dog — as recognition for finding the target odor. Dogs of all shapes, sizes and backgrounds are welcome. Dina says, ‘Mutts can be great, small dogs can be great. In the last study audition, we had a dog from death row named Schatzi; she made the team. It doesn’t really matter where the dog comes from.’ All that matters is that they’re able to sniff out whether a breath sample comes from a person who has cancer, or one who doesn’t. “ The dogs have shown that they excel at it. In the initial study Dina participated in, dogs were able to detect with 99 percent accuracy if a breath sample came from a patient with lung or breast cancer. Dina says, ‘There’s nothing in medicine that even approaches those numbers.’ They also tested how accurate the dogs were at indicating that a breath sample was not indicative of cancer. Dina explains, ‘So of course we have to give them healthy samples and we track their ability to ignore, or not alert, on a healthy sample.’ The dogs were 88 percent accurate in detecting cancer­free samples for lung and breast cancer. 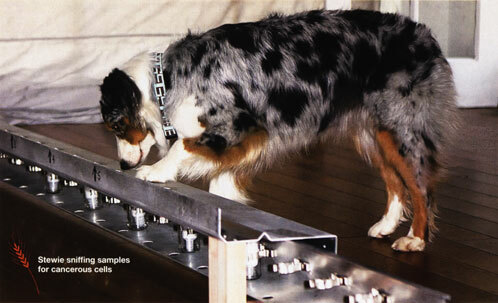 ^ Stewie sniffing samples for cancerous cells. “ Your Pet as a Medical Scent Detector? “ So far, no cancer detection studies have used cats as scent detectors. And there are fewer anecdotal stories in the media about cats detecting cancer. That’s another reason that Barbara feels certain that when she got Leo, she adopted a very special cat. She says, ‘He follows me everywhere I go; I’m so happy to have him. To me, he’s almost human.’ She admits that she still wants a black cat someday, but for now, Leo is her constant companion. ‘I wouldn’t trade Leo for anything,’ she says. Not even a black cat called Jack. SOURCE: Kelli Harmon, “Returning the Favor: Who’s Really Saving Who?” Best Friends Magazine, January/February 2014, pp. 30–35. First Issued: 4 July 2016.